I had spicy stir-fry tofu for dinner tonight. Anticipating a wide range of reactions to this. 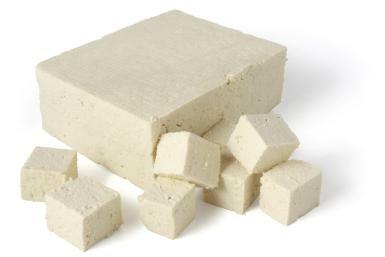 I love tofu, you guys. I know, not everyone does. For example, Drummer Boy does not love tofu and physically reacts whenever I order it at a restaurant. I'm not a vegetarian by any means. Pepperoni is my spirit animal, you know? A really good burger is my idea of Nirvana. But I also have no problem going meatless. I just don't think every meal, or even every day, requires the consumption of dead animal flesh. On the other hand, I've recently noticed that my body responds well to a diet that is lower in carbs and higher in protein, so I've been trying to eat fewer bready-things and more nutty-meaty-proteiny-things. It just so happens that tofu fits right in there. Now, I'm not about to try to convert Precocious Daughter to a fan of soybean curd. She has a lot of texture issues with food, and I'm pretty sure tofu would not meet her tolerances for mouth-feel. I'm not going to force it on her. But tonight, she was at a football game, and I was hungry, and I happened to have a package of firm tofu in the fridge. So I went for it. I concocted a coating/marinade of minced garlic, minced ginger, chili powder, fresh-ground pepper, olive oil, soy sauce, and cornstarch. I mixed it all together with my immersion blender and let it sit for a few minutes. 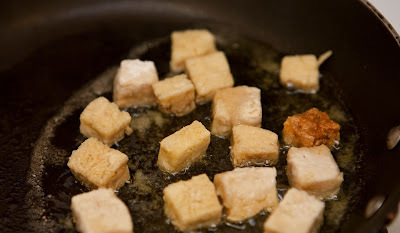 Then I cut a couple of ounces of tofu into bite-size pieces and sauteed them in coconut oil on medium heat, occasionally turning them, until they turned golden-brown. Then I stirred in my coating/marinade and cooked for about five minutes. I need to modify the recipe some, as the cornstarch made the coating clump up vs. cling to the tofu cubes more than I liked. Less cornstarch, more oil? Not sure. But the flavor was freaking amazing, combining the pungent taste of ginger with the heat of chili powder and the savory note of soy sauce. I'm actually going for "umami," but thanks, Ross. You know what? This may be my go-to by-myself-but-still-need-to-eat dinner. With requisite tweaking, of course. 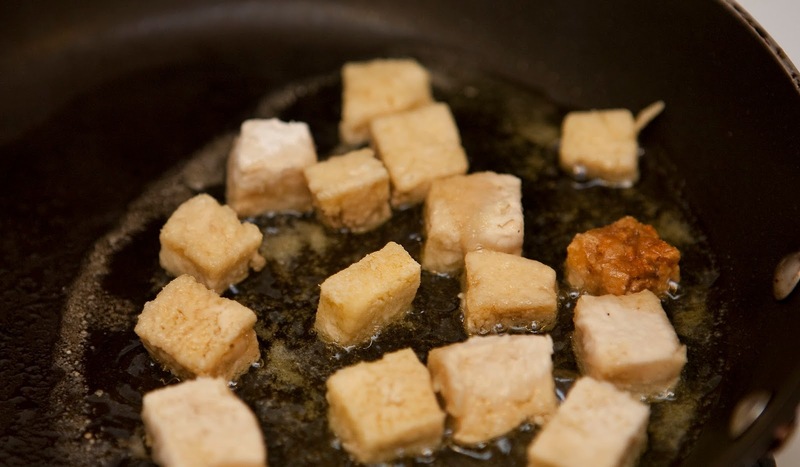 I heart tofu, you guys. Should I say that my eating habits match yours almost identically. This is freaking me out. I never use cornstarch though. I'm probably missing out on that glaze, but the name just grosses me out.